Amazon.com description: Product Description: Chivalry is not dead! Central figures in "The Matter of Britain," King Arthur and his Knights of the Round Table still inspire many books and films today. 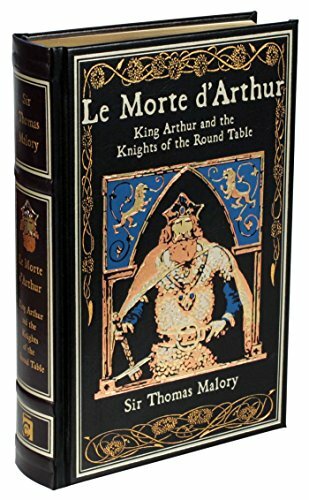 Drawing on the legends of Camelot from French and English sources, Sir Thomas Malory compiled the drama of illicit love, the magic of sorcery, and the quest for the Holy Grail into a sordid and chivalrous tale that's been recounted for centuries. This beautiful leather-bound volume, with gilded edges and a ribbon bookmark so you never lose your place, will be a treasured edition of classic Arthurian folklore in any home library. About: Chivalry is not dead!